Czech (with Slovak), French, German, Modern Greek, Italian, Polish, Portuguese, Russian and Spanish. Studying Modern Languages provides both practical training in written and spoken language and an extensive introduction to literature and thought written in European languages. As well as learning to write and speak the language(s) fluently, you can study a broad range of literature, or focus your studies on any period from the medieval to the present day. A wide range of other options allow you to explore subjects including linguistics, philology, film or gender studies or (in French and German) advanced translation. Modern Languages have been taught in Oxford since 1724. The faculty is one of the largest in the country, with a total intake of more than 250 students a year (including joint courses). 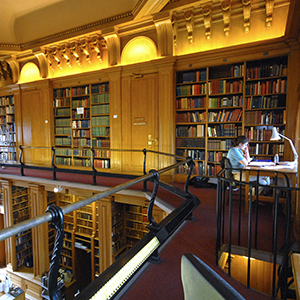 Undergraduate students have access to the Taylor Institution Library, the biggest research library in Britain devoted to modern languages, and the University’s central library the Bodleian, as well as many online resources. The University’s well-equipped Language Centre has resources specifically tailored to the needs of Modern Language students. 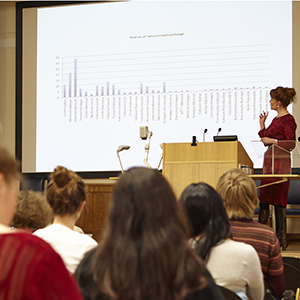 Language is at the centre of the Oxford course, making up around 50% of both first-year and final examinations. The course aims to teach spoken fluency in colloquial and more formal situations, as well as the ability to write essays in the foreign language, and the ability to translate into and out of the foreign language with accuracy and sensitivity to a range of vocabulary, styles and registers. You will also develop your reading skills to a high level. The study of literature gives you an understanding of other cultures that cannot be acquired solely through learning the language. It leads you into areas such as gender studies, popular culture, theatre, aesthetics, anthropology, art history, ethics, history, philosophy, politics, psychology and theology, developing your skills as a critical reader, writer and thinker. Modern Languages students spend a compulsory year abroad, usually in the third year. You may work as a paid language assistant in a foreign school or do an internship abroad, both of which provide valuable opportunities to develop career experience while improving language competence. Alternatively your year may be spent studying at a foreign university. (Students taking Beginners’ Russian spend the second year – as opposed to the third year – of their studies on a specially designed seven-month language course in the city of Yaroslavl’.) You will also be encouraged to spend as much of your time as possible during the vacations in the countries whose languages you are studying. In addition to the possibility of Erasmus funding, extra financial support, including travel scholarships, may be available from your college and/or the faculty. Please see our guidance on choosing a college, and which language combinations are available at each college. Your week’s work will include a tutorial in, or organised by, your college, language classes in the language(s) you study, and typically three to four hours of lectures for each subject. Tutorials are usually up to four students and a tutor. Seminar and language class sizes may vary depending on the options you choose or the language you are studying, but there would usually be no more than around 20 students and classes would often be much smaller. Most tutorials, classes, and lectures are delivered by staff who are tutors in their subject. Many are world-leading experts with years of experience in teaching and research. Some teaching may also be delivered by postgraduate students who are usually studying at doctorate level. To find out more about how our teaching year is structured, visit our Academic Year page. Your first year is closely structured. You will attend oral classes and courses on the grammatical structure of your language(s), translation into and out of the language(s) and, in some of the languages, comprehension. You will also attend typically three to four hours of introductory lectures and participate in seminars and/or tutorials on literature. If you study French, German, Spanish or Russian as a single language you will take a range of additional options in that language in the first year (see below). All other languages must be studied in combination with another language or another subject. Your other years of study give you more freedom to choose the areas on which you wish to focus, from a very wide range of options. Students may take Polish as a subsidiary language, beginning in the second year. Catalan, Galician, Provençal, Yiddish and most of the Slavonic languages may also be taken as additional options. Deferred entry Students are welcome to apply for deferred entry for any language courses except those including Beginners’ Russian. Year 3: typically spent abroad (Beginners’ Russian: students spend the second year in Russia, and the third year in Oxford). Year 4: continues the course from Year 2, plus special subjects across a wide range of options including film studies. Final University examinations: nine or ten written papers and an oral examination are taken, including unprepared translations, literature subjects, special subjects and linguistics. Some special subjects are examined by submitting a portfolio of essays. The options listed above are illustrative and may change. More information about current options is available on the Modern Languages website. There are several combinations available that allow students to begin studying a language from scratch. However, please note that it is not usually possible for students to study two languages from scratch or a language on its own from scratch. Candidates would be expected to have competence in at least one of the languages chosen. For French or Spanish Candidates would usually be expected to have the language to A-level, Advanced Higher, Higher Level in the IB or another academic equivalent. For Czech, German, Modern Greek, Italian, Portuguese and Russian Please note there are different course codes for these languages, depending on whether or not you have studied them before (see below). Beginners’ courses allow students to start studying one of these languages from scratch – otherwise they would be expected to have an A-level or equivalent (or, for German, an A-level or equivalent proven competence). The Beginners’ German course also includes an intermediate option for those who have studied some German. Find out more at the Modern Languages website. For Polish We generally expect all students applying for this course to be beginners, though those with experience are also very welcome to apply. These courses allow students to study a new language from scratch, along with another language which they have already studied to A-level, or equivalent. All candidates must take the Modern Languages Admissions Test (MLAT) as part of their application. Separate registration for each test is required and it is the responsibility of the candidate to ensure that they are registered for these tests. We strongly recommend making the arrangements in plenty of time before the deadline. For everything you need to know, including guidance on how to prepare, see the MLAT page. Description: Candidates are normally required to submit one piece of work in the target language to be studied, and one piece in English, please read below for further details. All candidates must submit one piece of marked classwork, normally a few hundred words in length, written in each language which you plan to study, and in which you will have A-level (or an equivalent standard) before university, by 10 November 2019. This will demonstrate to interviewers how you are developing in your use of the target language(s) in work you have completed in the normal course of your A-level (or equivalent) study. If you are applying for a language in which you will not have reached this standard before university, you do not need to submit anything in that language. All candidates must also submit one piece only of marked writing in English. The particular topic of your essay and the A-level (or equivalent) subject from which it is drawn are not important; it is intended to show how you construct an argument and express your ideas in English. If you do not have any recent marked work written in English (for example, because of the combination of subjects you are currently studying), you may submit a specially written piece of work, such as an essay in English on one of the topics you have been studying for your language A-level (or equivalent). It may be helpful to seek guidance from your teachers in devising a suitable title. In such circumstances, it would not normally be expected for this piece to have been marked, as it will not have been done in the normal course of your studies. As detailed in the selection criteria for Modern Languages, all submitted written work is considered in the context of the individual circumstances in which it was completed. Examples of written work required for different subject combinations: If you are applying to study French and German, you will need to submit three pieces of written work: one in French, one in German and one in English. If you are applying to study Spanish and Beginners' Russian you will need to submit two pieces of work: one in Spanish and one in English. Tutors will be looking for a good command of the grammar of any language you have already studied at school and want to continue studying at Oxford, as well as an interest in literature and culture. At interview, tutors will want to find out as much as possible about your intellectual interests and academic potential, so you may be asked about your reading, your interest in the culture of the relevant country, or the work you have submitted. You may be asked questions about a short text in English or the relevant foreign language(s). You will be given the opportunity to speak in the relevant foreign language(s) which you have studied to an advanced level. As far as possible, interviewers will try to let you show your strengths, interest in the subject(s) you intend to study, and reasons for applying to Oxford. For more detail on the selection criteria for this course, please see the Modern Languages website. Oxford aims to produce world-class linguists and the skills gained and fostered by studying languages at degree level are much-prized by employers. Their knowledge and transferable skills ensure that modern linguists are amongst the most sought-after graduates in Britain. Employers value Modern Languages graduates because they are competent in one or two languages, have acquired a range of transferable skills and have first-hand experience of other cultures. Amongst the careers successfully followed by modern linguists are: journalism, the Civil and Diplomatic Services, education, environmental and development work and the law. Courses including beginners’ Russian are slightly different, as they are the only courses with a prescribed year abroad option. Students have to take an 8-month Russian Language Undergraduate Studies course in Yaroslavl (www.rlus.co.uk) during their second year. Students will not incur an additional course fee, however, they will be liable for additional administration and visa fees. For students starting their year abroad in 2018 these fees are £145 and £45 respectively. To see the KIS data for each course click on the UCAS course code below. B in the table below stands for Beginners. These courses allow students to study a new language from scratch, along with another language which they have already studied to A-level, or equivalent. Deferred entry: students are welcome to apply for deferred entry for any language courses except those including Beginners’ Russian. Oxford Modern Languages has been consistently ranked in the top three in the QS world rankings by subject since 2014.